Note:#401 level travelers, especially those who’s employers pay for their flights should consider themselves exempt from these posts. We’ve covered it here before, but Standard Airline Elite status really isn’t worth much to Milenomics. In September I introduced our Be Your Own Elite Program here (BYOE), and I’ll be posting ideas as the months go by about this program, and ways to make your travel better with your own Elite status. The bait is the promise of upgrades, luxurious travel in the front cabin, and an overall better experience. As you slowly put more time, effort and money into this program you’re no longer able to think rationally–you’re blinded by the sunk costs you’ve spent already to get to the point you’re at in the program. Elite Status plays off these sunk costs to lure you further into the program. I’m asking you to stop, and think rationally about it. I doubt a that a few posts on Milenomics will stop you from re-qualifying–but I do want to continue to show you new ways to approach Elite status, and hopefully you’ll eventually agree to BYOE. Today I’ll add a few new strategies to the BYOE mix, and revisit some of what we talked about when the program was first rolled out. In our first post we talked about upgrades, and mentioned trading for status. I still advocate trading for status, especially with DL. You may even be able to status match your traded DL Gold to AS MVPG to extend this one more year. That’s a strategy I’d love to hear about if you do try it. In addition, today we’ll discuss one old strategy for Upgrades, and one new one. There’s no lack of SWUs out there. In fact the going rate for one is only going to come down as they get closer and closer to their expiration date. Get friendly with trading forums, or start talking to your friends who are EXP and have their SWUs unused. In extreme cases make friends with SWU brokers. We’ll talk more about mile brokers in future posts, yes they can be slimeballs–but there are also good ones out there. The important thing to do when trading for a SWU is that you pay only if it clears. What it basically does is place a floor on the value of Skymiles, of about 1 Cent per mile. (due to program specifics it isn’t exactly 1CPM). Most people use it to buy tickets outright with their miles, example:a $350 fare, 35,000 Skymiles. What it allows us to do is instantly upgrade using miles. Ideally you’d be able to book a low-level first class award and save your $393 in the first place. However, if you did buy the coach fare, with a price difference of $208 you could use 20,000 miles and $8 to “upgrade” yourself instantly. No worrying about space, no “will it clear,” You wanted first, you got First. Sure this won’t always work–LAX-JFK for example is easily $1000-$1500 more in First than in Coach. That would be 100,000+ Skymiles for the “upgrade.” Study your travel patterns and see when/where you can use your miles, and our tricks to your advantage. Again, this only works with DL, and only if you hold the right Amex Credit Card. Contrast this with AA/UA: With AA You’re usually paying 15,000 miles and a copay equal to a large portion of your ticket purchase price for a domestic ticket. International flights get even worse. For me the worst part of all of this is that these aren’t guaranteed upgrades. United’s Upgrade offer is equally weak. Expect to pay 15,000 – 20,000 miles plus $75-$175 for an upgrade. United sometimes offers “buy-ups” at checkin for $50-$250. I’d recommend doing those instead. No I’m not Greek. You probably aren’t either, but Aegean Air is. Alliances allow each program in an alliance to set its own elite tier levels. Aegean sets its Gold level low–20,000 miles low. Considering they have a flight that is just 84 miles (ATH-JMK) 20,000 miles probably seems like a lot to some A3 flyers. Aegean’s route map, including the 84 Mile ATH-JMH, flight time is 35 minutes. Since Aegean is a Star Alliance member instead of flying back and forth from Athens to Mykonos, credit your United and US Airways flights to an Aegean FF Account. Check to make sure your fare class earns 100% of flown miles. The qualification period is a rolling 12 months, so since this year is almost over, credit the rest of your flights this year, and early next year as well to Aegean. If you’ve got up to 20,000 miles left to fly this year you’ll gain Lounge access with this gold card. – Being top tier US elite doesn’t give you lounge access. 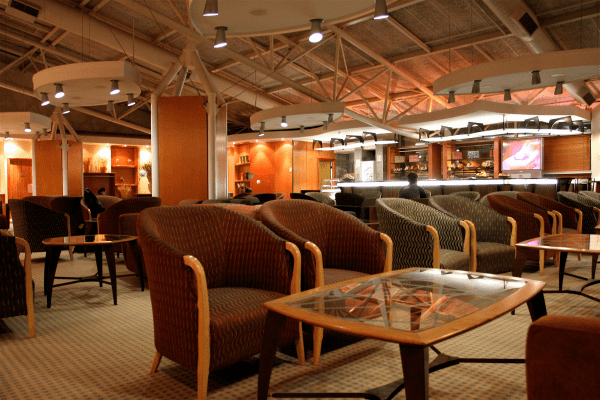 – Flying on Domestic paid F fares doesn’t give you lounge access either (certain premium routes do). Incorporating Aegean status in your BYOE strategy will let you enjoy lounges while you fly Domestically (should you want to). HT to: Lucky who first wrote about this 3 years ago. In our earlier BYOE post we mentioned the American Express Platinum card for Lounge Access. F2B Blogger Giddy for Points wrote up a great post on the Amex Platinum card. It covers the benefits of the card, and is a must read. I just don’t see the value for domestic flights. Sure you’re in a quiet room, with more space and power ports. There’s obviously a value to that. But there’s also a lot of negatives. Drink offerings are being cut back significantly, and I’ve been in domestic lounges where the “food offerings” consisted of carrot sticks and pretzel mix. With no outside food allowed in you’re probably better off eating in the terminal should you get hungry. While some flagship lounges are starting to look nice, the overall majority of the lounges you’ll experience will be letdowns. Should you still wish to try out lounges after that description there’s always those wonderful lounge passes. An AA Pass will cost you about $25 (ebay) and United passes about $20. Keep a pair in your carry-on luggage for those long layovers or when you want to drink cheap, free, crappy drinks. Flying Internationally lounges become much more important–they’re an information hub, a breakfast stop, a coffee refueling station, and most importantly, a hot shower. Fortunately, even on award tickets, flying internationally in Business or First gives you lounge access for free. Please share any BYOE strategies you use. I’d love to hear them. Tomorrow I’ll get more into Elite Status Sunk Cost analysis, and how it continues to trap us. For now remember, Be loyal to your wallet. I’ve shifted over the last year… companies now need to earn MY loyalty. Change your program and you run the real risk of losing me. Use Your Miles: Welcome. Sounds like we follow the same philosophy. An Airline needs to set itself apart or run the risk of being an “also ran.” Inconsistent service is also a personal pet peeve. I’ll throw in that redeeming Avios, even in coach, gives you Priority Access in American; allowing you to use 1st class check-in, priority boarding, a free bag and the short TSA lines. Good tip. I find that Avios also allow you similar benefits on Alaska–you can choose seats in exit rows and bulkhead rows. Those are usually saved for elites or more expensive refundable fare tickets. Many Chase cards, such as Ink products and Fairmont, give you 2 free Lounge Club access. Although the number of Clubs in US are limited, sometimes you luck out. 2 yrs ago I had never even been in a lounge. Then I discovered this whole world of miles and got the UA Club card. But after 2 yrs I’ve been quite disappointed with it. Use Your Miles is right- they need to earn our loyalty. Until that happens I suppose our benefits will continue to erode. The greatest advantage is int’l travel with shower access after an overnight flight. Spot on Paul–promise a lot, deliver as little as possible seems to be the way things go in the airline industry. So we’ll flip it around on them–take a lot, give a little. Domestic lounges are getting worse, that is for sure. Great information. I am really enjoying this series. Quick question though. I am an American living overseas and have an interest in the Aegean Airlines program you mentioned. On the registration form there is no space for my middle name. Does TSA..secure flight strictly enforce the “exact match” requirement? If so, should I register with my first and middle name as one word? You should always put your middle name on your ticket if it is on your id. You’ll just add your Aegean number on your booking for the flights you want to credit to Aegean. The question then becomes does Aegean care if your middle name is on your ticket, but not on your Aegean account. I couldn’t see how they would. The account signup page is for Aegean to keep track of you, not the TSA. Please report back if you do use Aegean. Thanks! I happen to be a new visitor to your blog and i am extremely impressed with the contents here. You really make sense in saving money and not just go with the blogs out there trying to exploit people’s weakness in terms of fake status and a mad crowd out there willing to be scapegoats. Internet needs more bloggers like you. Keep up the good work and continue to provide us with great insights in to what really matters in the end – milenomics. May God bless you and your family with all the happiness. Kumar: thank you for your kind words. I’m trying to push back against the prevailing thought process about Airlines and spending vs. Saving money. I’m glad you’ve picked up on Milenomics, and hope you find more info on the blog. Let me know if you have any questions, and welcome.